A big humpback whale has died after becoming entangled in rope off Scotland’s north-east coast. The whale was first spotted by a fisherman near the village of Helmsdale in Sutherland on Thursday evening. He alerted the British Divers Marine Life Rescue (BDMLR), which scrambled a team. However, rough seas prevented them from mounting a rescue. But at the weekend the whale was reported to be floating in the sea and retrieved on Sunday. It is now heavily bloated and on land. An examination of the creature will be carried out today by the Scottish Marine Animal Strandings Scheme. A spokeswoman for the BDMLR said:”The weather is too bad to attempt any rescue at the weekend. It was seen by a fisherman who reported it was tangled in black rope. 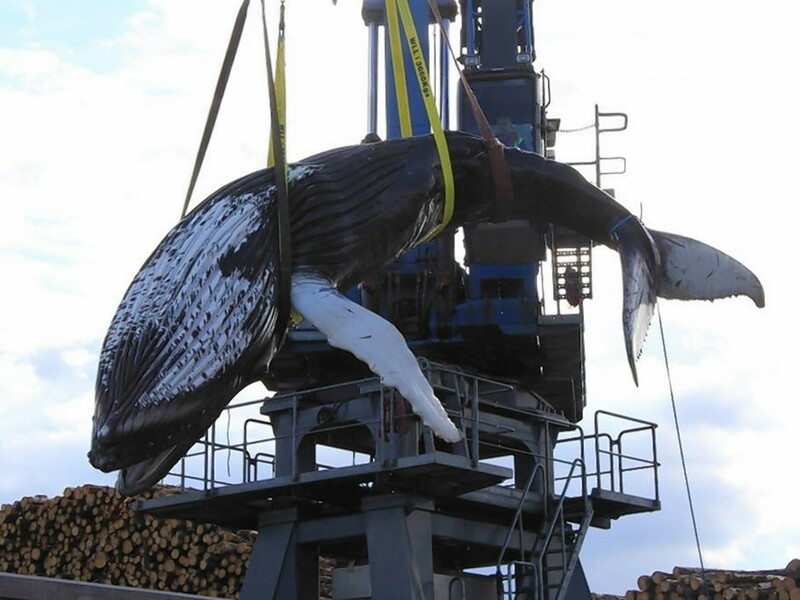 In 2004 a humpback whale was caught up in creel ropes off Shetland. The 25ft-long creature was spotted tangled in ropes attached to buoys off the shore near Vidlin, on the east of the islands. Last year a report said that more than a sixth of the most common species of whale found in Scottish waters have been damaged by fishing equipment. In its annual report, the Hebridean Whale and Dolphin Trust singled out areas north of the Isle of Skye and along South Uist as particular entanglement risk areas for minke whales. They are particular hot spots for creel fishermen whose ropes are a threat to the whales. However sightings of humpback whales in Scottish waters are rare. The only other two recorded by the HWDT last year was when a pair were spotted off Stoer Head in Sutherland and another off Point on Lewis. Humpback whales travel thousands of miles from warm-water breeding grounds in the tropics to the cold-water feeding grounds in the polar regions. They are thought to feed mainly on krill, herring and cod when in British waters. Last week, the BDMLR rescued 14 pilot whales which became stranded on Skye. Of the 21 whales which beached on Tuesday, four died and three more were euthanised. Six whales which returned to the area shortly after the stranding are still being monitored by the BDMLR but are not believed to be in danger. It is believed one has given birth to a calf. One of the pod briefly stranded again over the weekend but managed to refloat.